Ville de Lyon is a 10 to 12 foot vine that proudly bears beautifully rounded carmine flowers that shade to deep crimson around the edges. 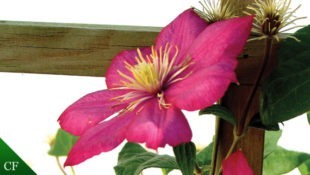 Lovely velvety texture and contrasting golden stamens create a striking blossom. The 5 to 6 inch blooms are born form June to September.